XALAPA, Mexico — A newspaper reporter in the Mexican Gulf coast state of Veracruz who was enrolled in a government protection program for journalists was killed Tuesday along with two other men, one of his editors and a journalist advocacy group said. Candido Ríos Vázquez, a crime reporter for the newspaper Diario de Acayucán, was at least the ninth journalist slain this year in Mexico. The State Commission for Attention and Protection of Journalists and Cecilio Pérez Cortes, deputy editor at Ríos' newspaper, said the reporter was in the federal government's mechanism for protection of journalists and human rights workers. Pérez said Ríos had been threatened repeatedly since 2012 by a former mayor of Hueyapán de Ocampo and had a panic button on his cellphone and a security camera at his home. Ríos had just finished his work for the day around 3 p.m. and was on his way home, Pérez said. Ríos apparently stopped alongside the highway in Hueyapan to speak with a former police inspector he knew who was also killed in the attack, Pérez said. Alex Chang, a Hueyapán councilman, said Ríos died on the way to a hospital in Acayucán. Late Tuesday, the state prosecutor's office said it was investigating the killings. 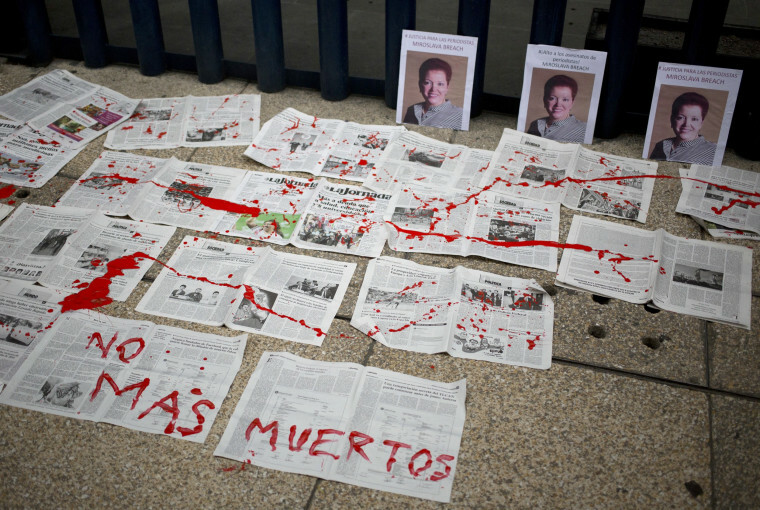 Mexico is now the world's deadliest country for journalists. The killing of the widely respected journalist Javier Valdez in the western state of Sinaloa in May brought renewed international attention to the issue. Veracruz has been one of the most deadly Mexican states for journalists in recent years. Ríos was the second journalist killed in the state this year. Newspaper columnist Ricardo Monlui was shot to death March 19 as he left a restaurant with his wife in the town of Yanga outside Córdoba. Ríos "started to do journalism because of the social struggle," Pérez said. "He always protested against injustice." He did not have academic training, but learned on the job, the editor said. The reporter started his career in a mountainous and largely indigenous area and advocated for farmworkers, women and migrants, Pérez said. He founded The Voice of Hueyapán and later joined Diario de Acayucán, where he had worked for 10 years. Pérez characterized Ríos as "combative" when it came to causes he believed in. Acayucán and surrounding towns are largely controlled by organized crime, making it a difficult place to do journalism, Pérez said. "We constantly receive threats," he said. In a short audio message that Ríos sent to Pérez on Tuesday afternoon, Ríos shouts to his boss over loud music about someone being wounded in a neighborhood. A minor story, Pérez said. Ríos signed off with: "May God take care of me. Good luck."